Everybody loves bread and butter pickles. If everyone is too general, let me be more specific. 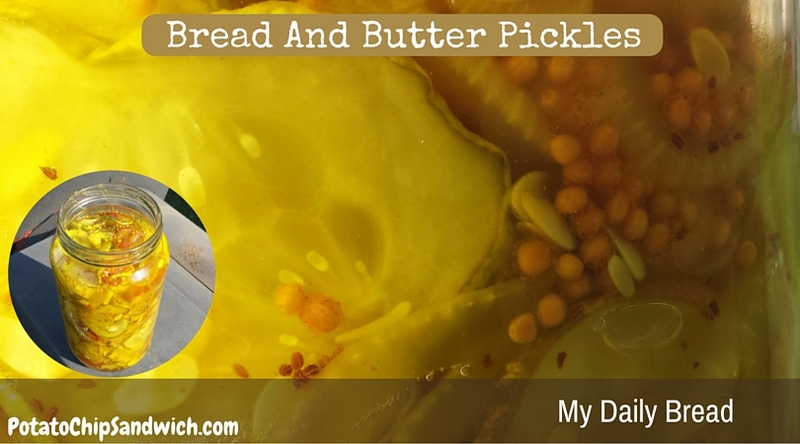 I love bread and butter pickles. I can eat them by themselves. No hot dog required. I don't need a bread, mustard, cheese, or mayo. In fact, I don't even need a reason. That's why I decided to make some with my mother in law Noni. 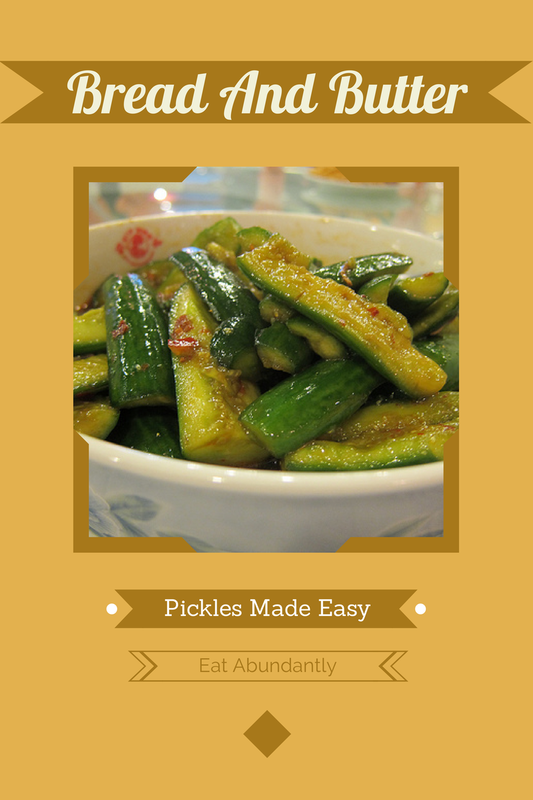 We used a basic recipe and the cucumbers from the garden. 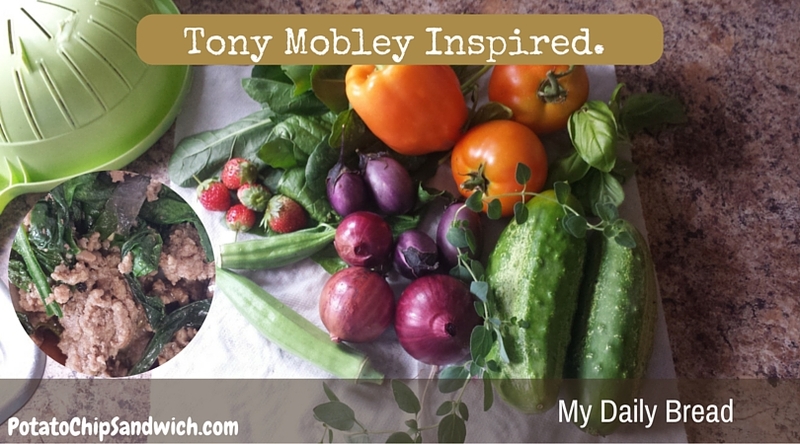 If you are trying to lose weight, and you don't know Tony Mobley, then follow that link. He's lost a lot of weight, and he's been off diabetes meds for over 220 days. And he shows no signs of stopping. But this blog isn't about that. It's about creating a dish from scratch after seeing Tony's delicious plate pictures. I thought.. dang, I grow a lot of that. Why not try it. So I did. And this is the results. 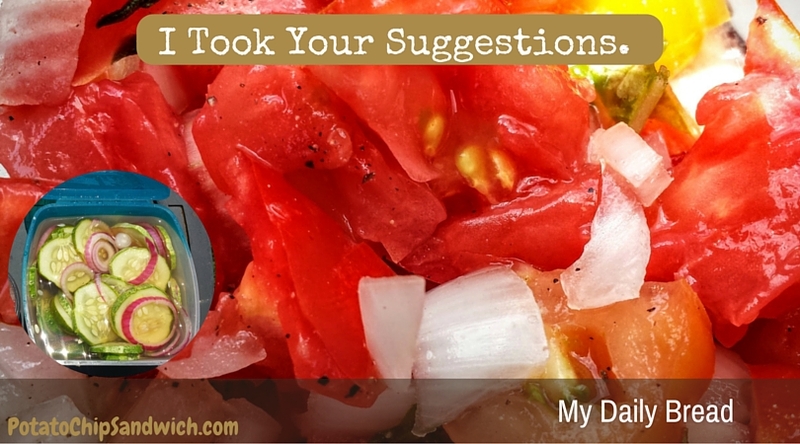 This week I asked a simple question about tomatoes. I asked what everyone did with the tomatoes that have bad spots in them. Whether it's from blossom end rot, worms, or a fungus, it happens. I've always had plenty of tomatoes, so I have been tossing them into the compost. I decided I wanted to find out what others think. I also got a suggestion for cucumbers. These are the results. Ok. I admit it. 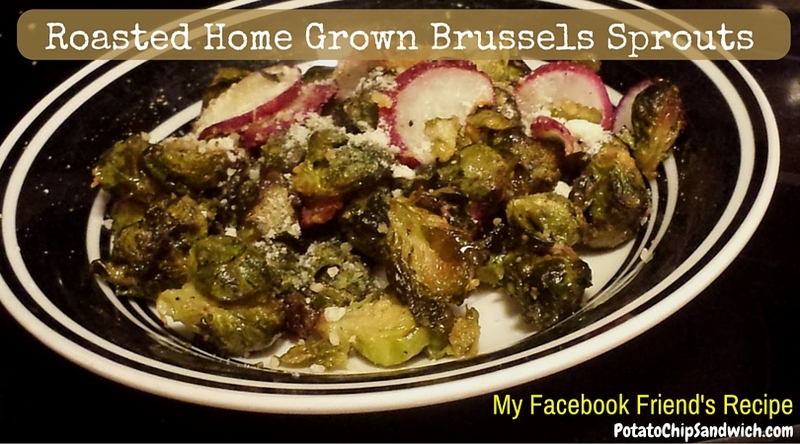 I've misspelled brussels sprouts about fifteen times this morning. I keep leaving off the 's'. I want to spell it brussel sprouts. But then I wouldn't be giving them proper credit to Brussels, Belgium, would I? At any rate, I grew some. Which is why it says "Home Grown" in the title. I have always steamed them. But I wanted to try something different, since these were special. I asked on Facebook. Almost everyone agreed. Roasting them was the way to go. This is the recipe I used. I'm a big believer in that. I don't like to see things go to waste. Especially when it's something I've grown. In this case, I had some sweet potatoes I grew in my garden. They had been curing for a couple of weeks. Originally, there was a large plate of them. But I only had a couple left, and I wanted to use them up. 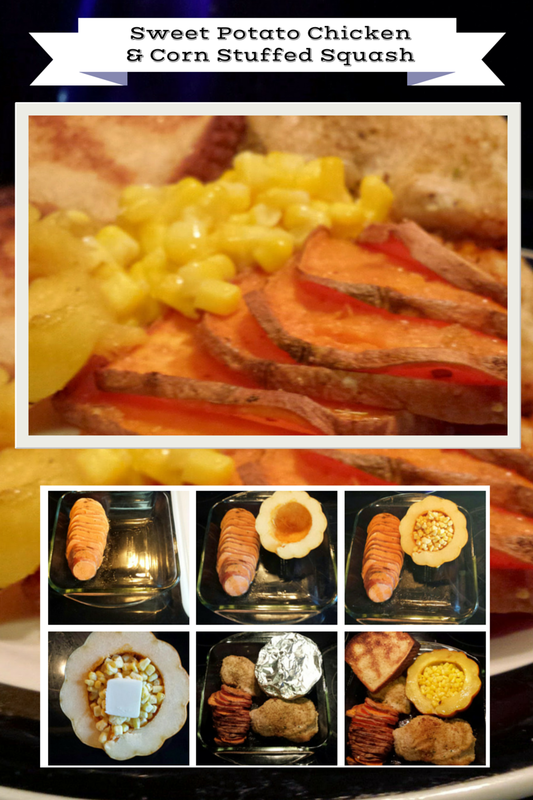 I wasn't in the mood for sweet potato chips, and I didn't want to crock pot them. So I decided that I would bake them. But sweet potatoes do not a dinner make. I needed some more stuff. That's the other stuff that I had available. So I knew I wanted to make something using those ingredients. But I didn't want to make a big mess. I didn't really know what I was going to make. I did know that it would have to fit in one pan, or baking dish. And I knew the ingredients all required different cooking times. The vegetables would take the longest. They would need to start cooking first. . This is +Julia Aspinwall, +Sherrill Duce and +Maggie Unzueta's fault. I don’t remember when, or where, but they are the ones that started it. We were in some online discussion about food. Most likely it was about bacon, ice cream, or some other spiritually enriching sustenance. Somehow that got turned into a conversation about bean sprouts. I remembered growing them in the 70’s. It was easy back then. Put some seeds in a bowl with water and a paper towel. Keep the paper towel damp. 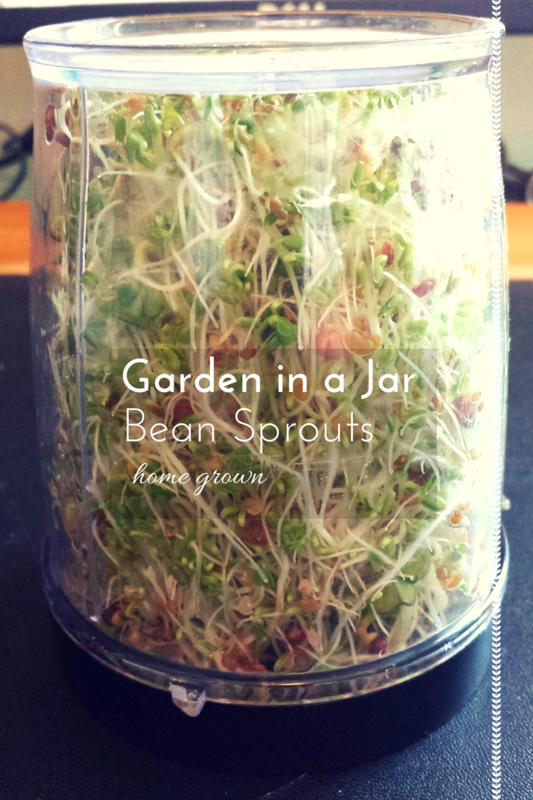 In a few days, you’ll have bean sprouts for your salad. So I decided to grow some. Naturally, I decided to do some research first. I learned that mung beans are the easiest to grow. I also found out that putting them in a paper towel isn't the way it’s done anymore. I needed a bell jar, some sort of mesh, and a rubber band. So I jumped in the car and headed to the grocery store. But they didn't have mung beans. Not even in the organic section. But the clerk said the “Health Food Store” had some. So I went there. I'm not really a big pickle fan. I usually ask them to leave the dill off of hamburgers and salads. If they don't, I either throw it away or give it to my wife. She loves them. but bread and butter pickles are different. They are sweet, crunchy and have a place on my plate. I can eat them with nothing else. they are a snack food during football games. I like a little red pepper in my pickles, but you can leave it out or add a little more. I've read that they got their name during the depression. People couldn't afford much, but cucumbers are easy to grow. Mom's could stick them between buttered bread and have a sandwich. The idea was that the person eating them would be eating vegetables. Some enterprising mom figured out if they pickled them first, they would last through winter. This was important since money was so tight. I don't know if this story is true, but I can tell you that I've had cucumber sandwiches. They are pretty good. Alert! I Just Ate Tofu And Liked It! Yeah. I know. It just doesn't sound that appealing does it. The facts are I didn't have much choice. My T25 5 Day Fast Track Recipe Book said that's what I was having for dinner. 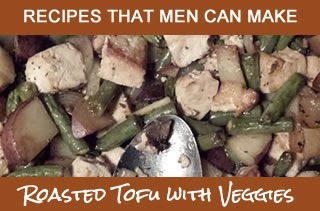 Since I did my grocery shopping last week based on the recipes, I had already accidentally purchased some Tofu. I didn't want it to go 'bad' sitting in the fridge for the next couple of years. So I cooked it. Then I ate it. And then I shared it. I have to admit. It wasn't bad. In fact, it was pretty good. Although everyone made fun of the dish, at the end of the night...none was left. I think that speaks for itself, so I figured I'd share the recipe. First of all, there was no way these pumpkins were still going to be any good. It was already way past Halloween, and almost Thanksgiving. They had been sitting on the floor for a good month or so. Cheryl kep telling me to make a pumpkin pie, but I didn't relish the idea of all that work. I finally caved in and decided to get started. I had to do some research first. That's when I found out about something called "Pumpkin Puree". As it turns out, you need pumpkin puree to make pumpkin pie. 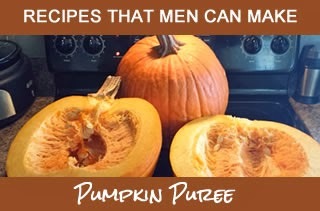 So I Googled pumpkin puree, and found out how somebody else had destroyed their kitchen making it. I decided to just let them sit and maybe they would go away. That didn't happen. I know you probably weren't expecting anything remotely resembling a vegetable on this site. But you'd be wrong. Collard greens aren't vegetables. I don't know what food group they are in, but they aren't a vegetable. They are more like a cross between a salad and a V-8. I happen to like them, so I grow them in my garden. 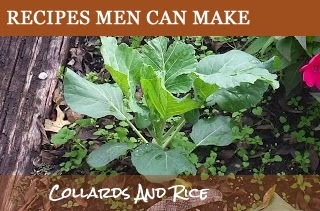 If you look at the picture.. that's where the collards in my recipes come from. I just walk out to the Garden and pick some. Yeah... it's what men do sometimes. Easy Peasy to make... and really good.